The Rapid Safe uses Radio Frequency Identification (RFID) for instant access. Simply place the included RFID bracelet, card, or key fob over the reader, and the Rapid safe springs open to present your handgun. It is built to exceed the ASTM International performance standards for youth resistant firearms containers. The Rapid safe provides a high level of child resistance and unauthorized access protection. The Rapid safe can be opened with the RFID bracelet, card, or key fob, or with a personally programmed code. It is also accessible with a conventional key lock. 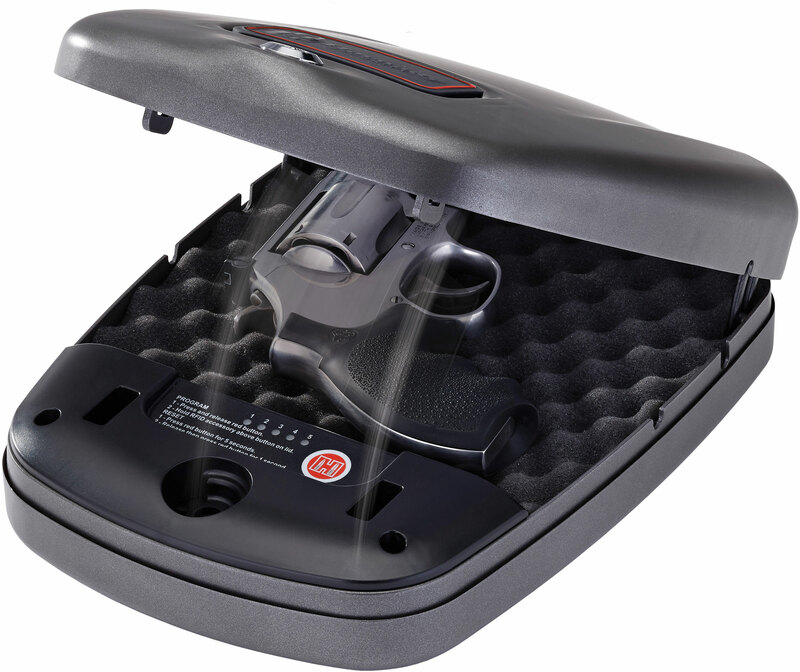 The Rapid Safe uses standard household 110V power which means your handgun is both protected and ready to go 24/7. The Rapid safe also features a battery backup that may be used as a primary power source. Upon opening, the internal Rapid Safe sleeve presents your handgun at the perfect angle. The Rapid sleeve is removable, enabling storage of most revolvers with barrels as long as 6 inches. The exterior measures 10.7 in x8.7 in x2.9 in . The interior measures 7 in x7.7 in x2.2 in .